In the throes of lust for avocados, we have seriously considered sourcing an avocado tree for the living room (that plan was nixed because apparently “we need a couch"). Despite the many diverse uses for the luscious fruit—from adding it to smoothies to rubbing overripe mash allover your body—it's still easy to fall into an albeit delicious guacamole rut. As good as guac can be, here are more recipes for making using of your green gold this summer. An avocado-ful eggs benedict is the best eggs benedict. 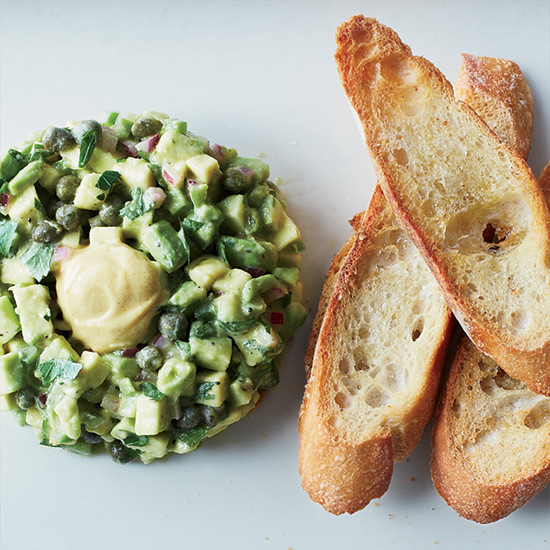 Finally, a tartare preparation the vegetarians can enjoy. Avocado stars along with an anchovy, parsley pesto in an hors d’oeuvre that will be gone in seconds. Mixing in caviar and goat cheese takes this from a run-of-the-mill guac and into the realm of next level dips. If guacamole grew up it would become this smooth, refined butter. This mixes three things we love: Avocados, Mediterranean food and pizza.